I have a new mixtape on deck from Yun Bama, that is available for streaming and download. 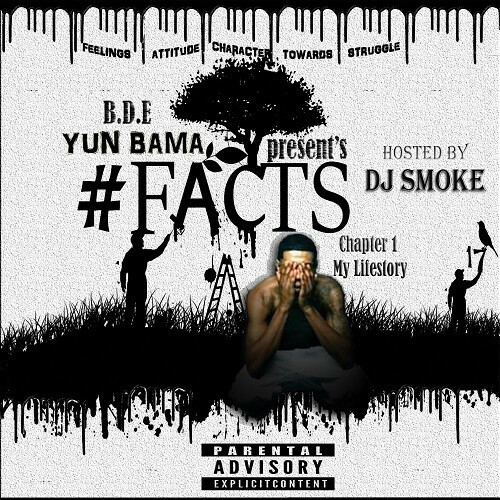 Yun Bama recently released his first mixtape titled “#Facts17”, hosted by Chicago’s own Dj Smoke. For those who don’t already know Yun Bama is a dope artist from Marion, Alabama. He relocated to Nashville, Tennessee, during his freshman year of high school. In Nashville is where he established his music career. Growing up with no father figure lead Yun Bama into some dark places in life. On February 17, 2011, Yun Bama was charged with conspiracy to commit first Degree Murder. He was facing 8 to 12 years at the young age of 17! While incarcerated Yun Bama began to write rhymes everyday as a way to pass time. He was later released a few months later on house arrest. Once released Yun Bama started turning up on the music scene. After seeing some signs of success Yun Bama began to dedicate his time and efforts towards doing music. In fact in early 2017 Yun Bama signed to independent label #BDE (Boy Dawg Entertainment). Since signing, he linked with Redsea & Company for production which led to their contribution to the “#Facts” mixtape. I recently linked with Yun Bama, I asked him to break down his meaning of #Facts. #F.A.C.T.S; in other words means (Feelings, Attitude, Character, Towards, Struggle). When describing his music, Yun Bama described it as “Pain Music”. Pain Music as described by Yun touches the souls of the people who have traveled a similar path as him. After a brief listening session I’ve come to the conclusion the top songs on this mixtape are “Crazy”, “Ride Wit Me”, and “Used To Be”! Make sure to place these songs on your streaming playlists, and mixtapes ASAP! Take a few minutes to follow Yun Bama on all of his social media accounts. I listed the names he goes by on each account below for you. Of course don’t be afraid to reach out to him for shows, appearances, or if you want to co lab on a hot track!